DotBot PC 1.13 - Download Win Apps. Navigate the mazes, collect metal parts and avoid the bad robots. Arcade fun for the whole family. 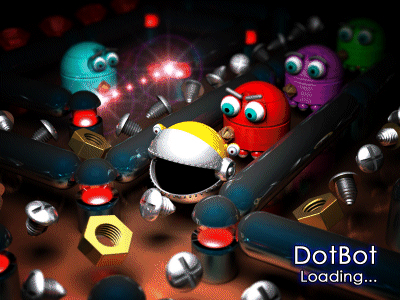 Navigate the mazes,collect all the metal and get the power parts to get those BadBots! Pick up bonuses and find the games secrets. This game is made with 3 goals in mind. Great playability, addictive gameplay and most of all, great fun. Run through 100 levels of action while using the bonuses and tricks you learn to aid you. Cool effects and plenty of options and features. Accelerated graphics card, 64MB RAM, 40 MB Harddisk space needed.